Reset oil service light Nissan L32 Altima. From years: 2007, 2008, 2009, 2010, 2011, 2012. How do you reset oil service light Nissan L32 Altima. From years: 2007, 2008, 2009, 2010, 2011, 2012. Turn the ignition to run, one position before starting engine/push START/STOP button once. Set a desired interval by pushing (circle) button to highlight ENGINE OIL and pressing (square) button. The reset mode will open up and allow you to enter the desired distance. Repeat step 3 for ENGINE OIL FILTER. 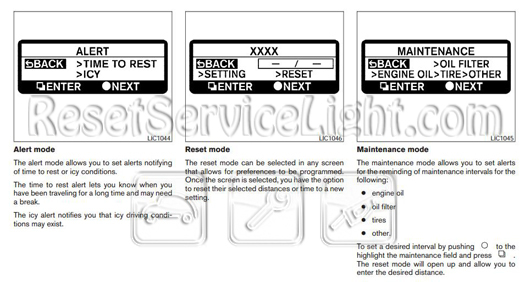 All information how to reset oil service light Nissan L32 Altima is taken owners manual. 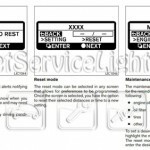 That it is the full procedure how to reset oil service light Nissan L32 Altima. If you like to reset any maintenance oil light after an oil change. Or reset check engine light, airbag light, inspection key or insp errors when maint reqd, for Nissan cars. Or any warning light for service reminder which appears on the display. Write in the search box the car name for which you want to find information, and find how to reset other service reminders when by yourself.